This study assessed the potential impact of heat stress on labor productivity in South Korea; as such, stress is expected to increase due to climate change. To quantify the future loss of labor productivity, we used the relationship between the wet-bulb globe temperature and work-rest cycles with representative concentration pathways (RCPs) 4.5 and 8.5 as the climate change scenarios. If only climate factors are considered, then future labor productivity is expected to decline in most regions from the middle of the twenty-first century onwards (2041–2070). From the late twenty-first century onwards, the productivity of heavy outdoor work could decline by 26.1% from current levels under the RCP 8.5 climate scenario. Further analysis showed that regional differences in labor characteristics and the working population had noteworthy impacts on future labor productivity losses. The heat stress caused by climate change thus has a potentially substantial negative impact on outdoor labor productivity in South Korea. 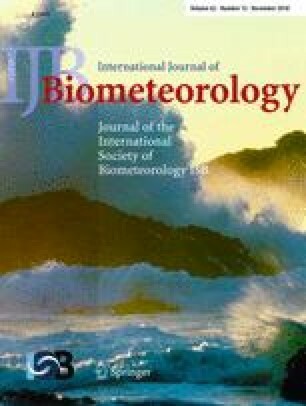 This work was funded by the Korea Meteorological Administration Research and Development Program “Research and Development for KMA Weather, Climate, and Earth system Services–Support to Use of Meteorological Information and Value Creation” under Grant (KMA2018-00122).